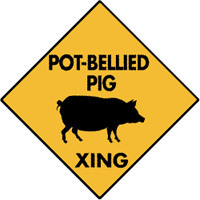 1 If your room has ever been called a pigsty, that is not such a great thing...except of course if you have a pet pot-bellied pig! 2 Pot-bellied pigs are intelligent animals that originally lived in Vietnam. They arrived in the United States in 1984. These cute piggies became so popular as pets that people called them "yuppy puppies." During the height of the pet pot-bellied pig craze, as many as one million people owned pet pigs in the United States and Canada. That is a lot of bacon! But these pigs are definitely not for eating. Like the vegetarian sharks in Finding Nemo, their owners' motto might be "Pigs are friends, not food." 3 A pot-bellied pig is a jolly, eager-to-please pet. They can learn lots of tricks. They can come when called. They can sit up and beg. They can even dance and catch a Frisbee! They seem to enjoy a good television program. They can be housebroken or taught to use a litter box. Some people think that pigs are sloppy, but pot-bellied pigs are naturally clean. They don't smell bad. Pot-bellied pigs can live up to 20 years. Some full-grown male pigs weigh 150 pounds! They are short and stubby. Even though their short noses look like they have been smashed against a glass window, they have an excellent sense of smell. Their great nose compensates for poor eyesight. They are named for their round belly. Most pot-bellied pigs are black, although some have white or tan spots. These pigs have a mostly straight tail instead of a curly one. They can wag their tails like dogs do.